Hello sir, I liked your website very much. I want to ask a question about baptism. As born again Christian I took baptism second time. I want to know are people not in Christ who had taken child baptism? Also I don’t think that taking baptism a certain way will make God love you. Thank you so much for your writing! I’ve been away from Christianity for a long time and learning about Swedenborg’s teachings had been an enlightening experience. One question I’m wrestling with is baptism. Do I need to be baptized? According to Swedenborg is it enough to be born again as you’ve written in another post? Baptism for me right now is definitely not practical, but I want to live these teachings. Thank you so much! Thanks for bringing up the subject of baptism, which is one of two rituals (the other being the Holy Supper) that Jesus Christ commanded us to observe. Being spiritually reborn by being cleansed from evil and falsity in our heart, mind, and actions. Let’s take a closer look. Along the way, we’ll answer the questions raised in these two spiritual conundrums. 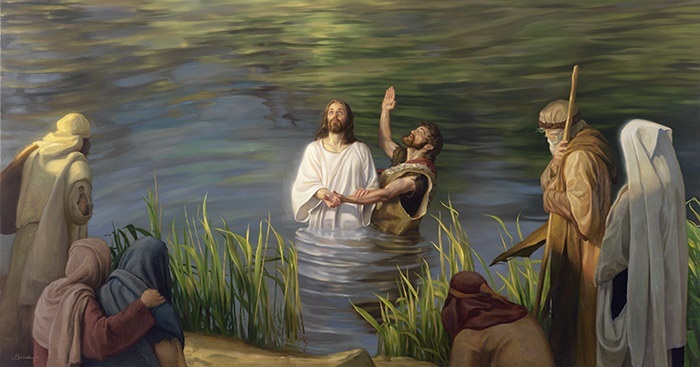 Earlier, at the beginning of his public ministry, Jesus himself had been baptized by John the Baptist (see Matthew 3:13–17; Mark 1:9–11; Luke 3:21–22). When John the Baptist protested that Jesus should be the one baptizing him, Jesus said, “Let it be so now; it is proper for us to do this to fulfill all righteousness” (Matthew 3:15). Jesus saw great significance in baptism, so much so that he wanted to be baptized himself “to fulfill all righteousness”—and of course, to set an example for all of his followers. Since it was directly commanded by Jesus Christ, every Christian church practices baptism in some form as a ritual in which a person becomes a Christian. One of the differences among the various Christian denominations is whether people should be baptized as children or only as adults. Some churches believe that baptism should take place when a person is old enough to commit his or her life to Jesus. So they practice adult (or teen) baptism rather than infant baptism. Other churches believe that infants and children of Christian parents should be baptized in order to show that they are to be raised as Christians—and in some Christian belief systems because they think it is necessary to baptize children in order to overcome original sin so that if the child dies he or she will go to heaven rather than to hell. The Faulty Foundations of Faith Alone – Part 2: Original Sin? When adults are baptized, they are committing themselves to becoming Christians and to following Jesus Christ. When infants and children are baptized, their parents, godparents, and guardians are committing themselves to raising the children as Christians until are old enough to make their own decision about committing their life to Jesus Christ. In Christianity, baptism is a ritual of introduction into the Christian church. In Judaism, from which Christianity originally came, circumcision is the ritual of introduction (for males) into the religion of Judaism. The New Testament makes it clear that circumcision is no longer required for Christians. So for Christians, both male and female, baptism takes the place of circumcision as a ritual of introduction into the religion. And since circumcision was to be performed when the baby was eight days old (see Genesis 17:9-14; Leviticus 12:3), baptizing infants is a continuation the practice of introducing infants ceremonially into their parents’ religion. In answer to Harshit Anjalika Murmu’s question, then, biblically speaking, there is a good basis both for infant baptism and for adult baptism. For people who have been baptized as infants or children, there is no need to be re-baptized. They have already been introduced into the Christian Church. However, for those who feel moved by the spirit to be re-baptized as adults when they make their own decision to commit their life to Christ, that is also a fine thing. And of course, adults who were not baptized as children should ideally be baptized when they become Christians. What if baptism isn’t practical for me? And yet, in answer to Michael’s question, it is not so much the ritual of baptism but the deeper spiritual reality of baptism that matters most. If for some reason an adult who was never baptized becomes a Christian in his or her own mind and heart, but does not live near a Christian congregation that he or she feels comfortable getting baptized in, the important thing is to live in the spirit of baptism—which we’ll take up later in the article. I should add, though, that baptism is not an exclusive ritual. If a minister baptizes you, that doesn’t mean you’re getting baptized into that minister’s particular church or sect. Rather, it means that you are getting baptized into Christianity—into the religion that looks to Jesus Christ as Lord and Savior. If the issue is that there is no church of one’s own denomination nearby, it is perfectly valid to be baptized by a local minister or priest whom you feel comfortable with, and who is willing to baptize you knowing that you are interested in becoming a Christian rather than in joining his or her particular church. Some clergy will do this, and some won’t, depending on their specific denomination and beliefs. If you wish to be baptized, but live far from a clergyperson who shares your particular Christian faith and beliefs, ask around locally to see if there is a minister or priest in your area who will happily baptize you into the Christian faith and life even if you may have differing views of exactly what that faith and life is. Though baptism is, in the end, only a ritual, and not essential to Christian life and salvation, I would encourage anyone, child or adult, who becomes Christian to get baptized whenever there is an opportunity to do so. For one thing, Jesus Christ himself commanded baptism as the ritual of introduction into his church, and was himself baptized as an example for all Christians. No, it doesn’t have to be full-immersion. Yet that is how people were baptized in New Testament times. And I believe there is a powerful symbolism in fully immersing one’s body in the cleansing waters as a sign of fully immersing oneself in the Christian faith and life. So if you can find a clergyperson who will give you a full-immersion baptism, so much the better. And if it’s in an actual river rather than in a horse trough, you’re golden! Because Jesus himself, and the earliest converts to Christianity, were baptized in the Jordan River. The Jordan River has a special symbolism in the Bible. When the Israelites first entered the Holy Land, they did so by crossing through the miraculously parted Jordan River (see Joshua 3–4). Symbolically, passing through the flowing waters of Jordan in the ritual of baptism represents entering the Holy Land of spiritual life through the living waters of Jesus’ teachings. Still, I completely agree with Harshit Anjalika Murmu: “I don’t think that taking baptism a certain way will make God love you.” The most important thing is not how we perform the ritual physically, but how we live by it spiritually. Now, in response to Michael’s question, let’s look more specifically at what Emanuel Swedenborg (1688–1772) said about baptism. Swedenborg considered baptism and the Holy Supper to be the two key “sacraments” that Christians should observe, since they were directly commanded by Jesus Christ himself. For those who want to read Swedenborg’s own words about baptism, there is a short version and a long version. The short version is found in The New Jerusalem and its Heavenly Doctrine #202–209. To read them online, just click on the above links for the first section numbers. Then click the “Next” button to continue on to the next section, one after another. For a more contemporary and readable translation of the short version, you can find my own translation, minus the concluding set references to Swedenborg’s Secrets of Heaven, here. Or get it in print form by purchasing a copy of The Heavenly City: A Spiritual Guidebook. The first function of baptism is to bring people into the Christian Church and at the same time to bring them into the company of Christians in the spiritual world. The second function of baptism is to allow Christians to know and acknowledge the Lord Jesus Christ as Redeemer and Savior, and to follow him. The third function of baptism, and its ultimate purpose, is to lead us to be regenerated. True Christianity is addressed specifically to So when he talks about what “people” must believe or do, he’s talking about what Christians must believe and do, not about what Jews, Hindus, Buddhists, Muslims, and so on must believe and do. In the last paragraph he uses the example of a traditional Christian baptism. However, that doesn’t mean he’s saying this is how we must perform baptisms. If some of his language sounds fancy and philosophical, don’t worry. We’ll unpack his meaning in the rest of this article. From all that has been said on this topic so far, it is possible to see that the three functions of baptism work together in unity as the first cause, the intermediate cause or means, and the last cause, which is the result and the ultimate purpose of all that went before. The first function is to identify us as a Christian; the second function, which is a consequence of the first, is to allow us to know and acknowledge the Lord as the Redeemer, Regenerator, and Savior; and the third function is to lead us to be regenerated by him. When that happens, we are redeemed and saved. Since these three functions follow each other and come together in the last, and since angels see all three together as forming one thing, therefore when baptism is performed or read about in the Word [the Bible] or mentioned in conversation, the angels who are present take it to mean regeneration rather than baptism. For example, the Lord’s words, “Those who have believed and have been baptized will be saved, but those who have not believed will be condemned” (Mark 16:16) are taken by angels to mean that those who acknowledge the Lord and are regenerated are saved. This is also why the Christian churches on earth refer to baptism as the washing of regeneration. It is important therefore for Christians to know that people who do not believe in the Lord cannot be regenerated, even if they have been baptized. Being baptized but having no faith in the Lord does absolutely nothing for us. It should be very well known to every Christian that “baptism” includes being purified from evils and regenerated. When a baby is being baptized, the priest draws a cross, as a reminder of the Lord, with one finger on the baby’s forehead and chest, and then turns to the godparents and asks, “Does this child renounce the Devil and all his works? Does this child accept the faith?” The godparents reply on behalf of the child, “Yes indeed.” Renouncing the Devil (meaning evils that come from hell) and having faith in the Lord are the elements that carry us through the process of being regenerated. Now let’s put all of this in more contemporary terms. Baptism is based on a ritual that is (I hope!) as old as humanity itself: the act of washing. Most of us wash ourselves in one way or another every day, and think little of it. Not only do we wash our entire body regularly by bathing or showering, but we wash our hands, face, feet, and other parts of our body whenever they get dirty, or before eating, or when we go to bed at night or get up in the morning. We also wash our clothing, the dishes we use for our meals, our cars, and sometimes even our houses. And then there are all of our other acts of grooming, such as combing, brushing, and cutting our hair, trimming our nails, shaving (some of us, anyway! ), and so on. In fact, we put quite a lot of effort into cleaning and caring for our bodies, and making ourselves presentable. It is simply a part of life. If we stop to think about it, we will quickly realize that life without washing is something we would prefer not to think about. Lately I’ve been watching the reruns of the old M*A*S*H TV series that ran from 1972 to 1983. In one episode (“The Smell of Music”), the two leading characters, Captain “Hawkeye” Pierce and Captain B. J. Hunnicutt go on a shower strike to protest the French Horn playing of their tentmate, the high-born and sanctimonious Major Charles Emerson Winchester III—who, I must say, is a really bad French Horn player! Hawkeye and B. J. get progressively smellier, until they are barred from entering the mess tent. They are forced to eat at a table outside, where they can’t even stand the smell of each other. Finally, the entire camp forms a mob to hose them down, douse them with soapy water, and give them a scrub. Then they dispatch Charles’s offending French Horn by running it over with a jeep! Fortunately, most of us don’t go without bathing so long that we become the target of a spontaneous mass demonstration! But there are some unfortunates who either do not or cannot bathe. They generally live on the fringes of society, often outdoors, eating and sleeping separately from the rest of society. And their unwashed condition is an emblem of their position outside of “acceptable” society. Yes, we take washing for granted . . . until we encounter those who don’t wash. Then we realize that keeping ourselves clean is not only a regular part of life, but a critical one. Not washing has health consequences as well as social ones. The dirtier we get, the more likely we are to contract various diseases that accompany the growing filth. In short, dirtiness is a hazard both to our social relationships and to our health. And persistent dirtiness is usually a sign that something is seriously wrong with a person. This sets the stage for us to understand both the necessity and the power of the sacrament of baptism. Of course, as a physical act, baptism doesn’t accomplish much. Those who are baptized by full immersion do, I’m sure, come out just a little bit cleaner than they went in. But I’ll bet they take a shower that morning anyway! For those who use only small, symbolic amounts of water, the physical effects of baptism are virtually nil. Well . . . perhaps it produces a few crying babies. But that is soon remedied when the little ones are handed back to their parents. Clearly, the purpose of baptism is not physical washing. What, then, does baptism do for us spiritually? Let’s put Swedenborg’s three functions of baptism into more contemporary language. By itself, if we take baptism as a mere ritual, it does very little. But even as a ritual, it does accomplish one thing: it introduces us into the Christian Church. Baptism is universally recognized by Christians as a sign that a person is a Christian. And though some Christian churches require re-baptism into their own church, many others recognize any Christian baptism. And of course, non-Christians are generally aware that the ritual of baptism is how people publicly identify themselves as Christians. So the first reason for people who have accepted Jesus Christ as their Lord and Savior to get baptized is very simple: it is a widely accepted public sign and symbol that the person is now a Christian. This leads to the second power that baptism carries with it. Once we have become a Christian, we have direct access to the one for whom the Christian church is named: Jesus Christ. Of course, anyone, of any religion, can read the Gospels and learn from the wisdom of Jesus. But only Christians approach Jesus Christ as “God With Us”—as the unique human presence of the Creator and God of the universe. When we call ourselves Christians, and introduce our infants and children into Christianity through baptism also, we bring ourselves and our children into a broad fellowship of Christians in which we can know, love, and follow our Lord, God, and Savior Jesus Christ. And notice that we are not only to know Jesus Christ, but also to love and follow him. It is not enough merely to be called a Christian and to believe in Jesus Christ. Jesus himself said, “Not everyone who says to me, ‘Lord, Lord,’ will enter the kingdom of heaven, but only those who do the will of my Father who is in heaven” (Matthew 7:21). It is no accident that Jesus chose a ritual of washing to symbolize introduction into the Christian church. But the washing that he wished to lead us toward was not physical washing—as important as that is for our life here on earth—but spiritual washing, which is essential for our life in eternity. You see, even if there is no such thing as original sin, each one of us does have many inborn tendencies toward selfish and evil thoughts and desires. And each one of us has also indulged in many words and actions that are not right. In plain terms, we have all said and done things that are wrong and evil. These things are like psychological dirt that clings to our character. If we don’t wash that dirt from our mind and heart, it will keep building up within us until we become odious to the people around us. Even worse, it will cause us to sink into spiritual disease and death. If we are spiritually filthy, we will never be able to enter the eternal brightness and beauty of heaven. To do that, we must wash ourselves and make ourselves clean through the practice of inner baptism. This baptism involves a lifetime spent cleansing ourselves of all our evil thoughts, desires, and actions, day in and day out. And as Christians, we do this through the power of Jesus Christ working within us. Through this daily practice of spiritual cleansing symbolized by baptism, we become Christians not only in name, but in spirit and in reality. This is the true, spiritual meaning and power of baptism. It is the power to make us new creations in Christ (see 2 Corinthians 5:17). For more on how to go about this process of spiritual baptism, please see the articles linked below. What does it Mean to be Baptized with Water, the Holy Spirit, and Fire? People who make a death bed conversion are not baptized. The thief on the Cross was not baptized. I believe that baptism like circumcision of the Old Testament is a symbol of a covenant of faith between you and God. It is a representation of something that has already occurred, which is belief in Christ as Saviour. Jesus said teach them and baptize them… bring them into the earthly Kingdom of God… what we call the church the family of God. I look at baptism not as a necessary thing that saves you but a celebration on which way your headed–you have taken a path and want to celebrate it with friends and family. Yes! Baptism is also a celebration and a joyful occasion. I have rather split feelings about baptism. My main issue is that is seems rather… exclusive. That also goes for what I feel about modern religions. In my opinion, religions should not exist today, but not in the atheistic sense. In this age of enlightenment we should lay down old differences and compare and contrast different scriptures and books to find commonalities, for they all lead towards the same God. People should embrace those commonalities and work towards to same goal. One can serve the same God and the same belief without abandoning one’s culture. Yet it is the arrogance of man that makes them think that their religion is better and that their words are more true than those given to others. I feel like this arrogance or whatever one would want to call it is the sole reason why devided and conflicting religions still exist. This is why I hesitate to think bout baptism. It has become a ritual that is central to Christianity. The way I see it, however, when Jesus walked the Earth, there was not such thing as ‘Christianity’. All that Jesus said wasn’t some sort of guideline on how to make one particular religion. He told us about the very essence of human existence. So this baptism should have a deeper meaning than just some admission ritual for Christianity. Looking at myself, though I spend the majority of the time studying the Bible, primarily the way Swedenborg taught it, I also brach out into other religions, like reading the Quran or delving into eastern religions. All of this has one goal though. I try to understand what God was trying to convey to those people and what I can learn from it to become a better human and be closer to God. The parallels are plentiful and I have learned a lot from other texts by approaching it with this attitude. This is why I do not particularly like identifying myself as a Christian. Religion should not be some exclusive club, nor should there be a conflict between them. I see myself as nothing more and nothing less than a human who wants to be a good terms with his Father and fellow human beings. This goal has become so central to my life that I find the idea of religion rather distasteful. You said it yourself in one of your articles about our daily work that religion is not something we do on weekends, but something that should be integral to our lives and our daily activity. So why treat it as something that is segregated from our normal lives? Is it not time to transcend the idea of religion and move closer to our Father by living in unity and no separation between worldly and spiritual afairs? Sorry, I think I went slightly off-point with my ramblings. Thanks for your thoughtful comment. I do understand and sympathize, and agree with much of what you are saying. The fact that baptism has been commanded is abundantly clear from John’s baptizing in the river Jordan—all Judea and Jerusalem came there to be baptized (Matthew 3:5-6; Mark 1:4-5). Even the Lord our Savior himself was baptized by John (Matthew 3:13-17). The Lord also commanded his disciples to baptize all the nations (Matthew 28:19). It is Christian in name only not only because it has long since abandoned Jesus Christ’s, and the entire Bible’s teachings about salvation, and substituted human-invented doctrines for them (see the previous article, “Today’s Christianity: Vastly Void of Truth”), but also because it has turned Christianity into an exclusive club in which “we” are saved, and everyone else is evil, wrong, and headed for eternal torture in hell. I therefore sympathize with people who love Jesus Christ but don’t like Christianity and don’t want to be associated with it. Over time, I expect to see the influence of that former “Christianity” wane more and more, and lose its standing so that it is no longer what people think of when they hear the word “Christianity.” But that day has not yet arrived, and “Christianity” still leaves a bad taste in many people’s mouths. Personally, I struggled with this issue for many years, but ultimately decided to identify myself as a Christian and do my best to resurrect and rehabilitate true Christianity in the minds of those I am able to reach. That is the approach Annette and I have taken on this website, while presenting a broad and universal message with many of our articles as well. Chief among these is the most popular article on this website by far: “If there’s One God, Why All the Different Religions?” We are very pleased that among the 200+ articles we have published here, this one, especially, has struck a chord. It has attracted well over 100k hits since we first published it four years ago, and is currently averaging over 250 hits per day. This gives us hope for humanity! Back to baptism, though this article does present the “Christian” aspect of baptism, I also hope it conveys something of the deeper meaning of baptism that Swedenborg refers to in the quote from True Christianity. Really, baptism is all about the process of inner, spiritual rebirth and growth, popularly known to Swedenborgians as “regeneration” (see: “Heaven, Regeneration, and the Meaning of Life on Earth”). If that inner spiritual transformation and growth does not happen in a person who has been baptized, then the baptism itself is a hollow shell with no meaning. Of course, whether or not to be baptized (as an adult) is a decision that people must make for themselves, based on their own spiritual understanding and path. I would only say that I truly believe, as I said in the article, that baptism is not into any particular Christian sect or denomination, but into Christianity as a whole—meaning the broad fellowship of followers of Jesus Christ. However, as I also said earlier in this comment, unfortunately, much of what passes as “Christianity” today is not really Christian at all. And as long as that is the case, it will give baptism a bad name. So I understand and sympathize with people such as you who do not want to be baptized because they do not want to be associated with a so-called “Christianity” that is very far from what Jesus Christ taught and showed by his life as conveyed in the Gospels. I have seen that the article about one God and multiple religions is right up there, but the amount of hits it gets is really good. I am happy for you. I like your approach of keeping the real idea of the Christianity alive and ‘promoting’ it throught he website. This is an approach I may look into myself, if only to get rid of that bad rep that surrounds Christianity today. As for the baptism, I do not really know how such a ceremony works, but whenever I read anything about it, all the prominent websites that come up involve something about accepting that Jesus died for our sins and all the other hollow things that contemporary Christianity teaches these days. Such a ceremony needs to be done by a Minister, Priest or someone like that, right? I am not sure how I would feel to baptised by someone who has a wrong idea about Christianity means or pretending to be doing it for the wrong reasons. And besides, if baptism is clearly focused on the spiritual meaning, as most things are in the Bible, how much worth is such a ceremony anyway? From what I have gathered, Jesus wasn’t all that big on ceremonies in his teaching. The main focus was always something practical that involved helping or bringing happiness to others and how to ‘do things the right way’. Why would the baptism ceremony be even that important if the main purpose was the spiritual washing? Just to drive the point home? I hear you about getting baptized by someone who has the wrong idea about Christianity. Getting baptized by a fundamentalist minister would not be your thing! But there are more mainline Christians who have a somewhat better idea of what baptism is all about. It would be a matter of finding someone whose view of Christianity and Jesus Christ is more practical and life-centered. Or if you happen to travel to any place where there is a Swedenborgian church, especially one of the more liberal ones, you could arrange for the minister there to baptize you, if that is something you decide you want to do. As for the requirement that it be done by a minister or priest, I believe that is more tradition than biblical teaching. Neither John the Baptist nor Jesus’ disciples were priests, yet they baptized. In fact, the whole concept of priesthood is suspect for Christianity. See: “Christianity is Dead. Long Live Christianity!” And although Jesus did give his Great Commission to his remaining eleven disciples, I don’t think of it as an exclusive commission. Plus, the disciples still were not priests. Priesthood didn’t re-enter Christianity until later, when its corruption had already begun. My own view is that it is perfectly valid for any committed and experienced Christian to baptize new Christians, not to mention celebrating the Holy Supper with others who share their Christian faith. 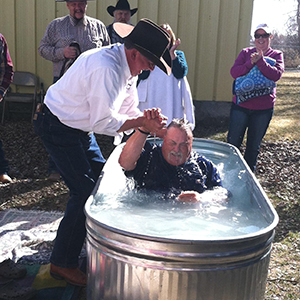 Getting baptized by a minister is, however, generally more accepted in society. For some people that may be a reason to have a minister do it. It is also true that Jesus’ teaching was more about living a good life than about engaging in ceremonies. But there were two rituals or ceremonies that he did command us to observe: baptism and the Holy Supper. So he didn’t do away with ritual entirely. He just pared it down to two very simple, meaningful rituals that took the place of all of the ancient Jewish rituals of purification (replaced by baptism) and sacrifice (replaced by the Holy Supper). The above article covers some of the reasons for baptism as a ritual. And I do think it has value. We humans need to express our convictions in action, and baptism is an action that expresses and symbolizes our commitment to cleanse ourselves from inner evils (wrong thoughts and desires) and the wrong actions that come from them, and to live a better life both inwardly and outwardly. Still, as I also said, whether to get baptized is a personal decision—and as you are well aware, there are many issues related to it. A person can still live a good life and go to heaven without being baptized. In the end, living in the spirit of baptism is what’s most important. Hi! I appreciate your eagerness in studying God’s word deeply. However, I would like to ask you where in the Bible does it say that babies who die directly go to heaven and become an angel? There is no proof that humans become angels upon death. Can you elaborate on that? Thanks! See that you do not despise one of these little ones. For I tell you that their angels in heaven always see the face of my Father in heaven. If the angels of these little ones always see the face of the Father in heaven, and our Father in heaven is not willing for any of them to perish, how could the Father allow any of them who die as infants and children to perish in eternal death?